It’s a good thing “The Lego Movie” hadn’t come out in the late 80s or early 90s, otherwise my parents would be broke. The story focuses on a minifigure named Emmet (voiced by Chris Pratt). He’s just your average guy, living life according to the instructions. He does his exercises, drinks his overpriced coffee, indulges in the latest craze, a song called “Everything is Awesome,” and heads off to work. However, little does he know that Lord Business (Will Ferrell) is about to demolish his awesome existence using a super weapon called The Kragel. The Master Builders have been hard at work trying to track down the only item that can shut down The Kragel, The Piece of Resistance, but it’s Emmet who happens to stumble upon it and, according to Vitruvius’ (Morgan Freeman) prophecy, that makes Emmet “The Special,” the only one capable of putting a stop to Lord Business’ plan to end the world. As someone who grew up with and still has an affinity for Legos, “The Lego Movie” is quite literally a dream come true. Sure it was fun sorting through instructions, putting cars, pirate ships and spaceships together piece by piece and then embarking on an epic adventure using your imagination, but what if there were no big, fat human hands to tarnish that visual? Almost every single movement and action sequence in “The Lego Movie” is just what anyone might create manipulating the toys with their hands, but as though the minifigures are doing it all on their own and it’s downright magical. 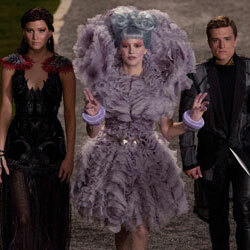 The trailer for The Hunger Games: Catching Fire has finally arrived via the MTV Movie Awards and not only does it meet expectations, but far exceeds them by delivering a more thorough teaser trailer than the one for the first film. However, that initial reaction comes from someone who’s read the books time and time again. As exciting as it can be to see material you know and love come to life, in the case of this promo there’s a chance Catching Firenewcomers are till yearning for a clear-cut narrative to latch onto. The piece appropriately opens in a way that gives you the sensation that it’s picking up right where the first film left off, making for the perfect stepping stone back into the world of Panem. Whereas the editors could have shown a cut-and-dry clip of Katniss and Peeta greeting the Victory Tour crowds, the scene gets layers and more weight courtesy of the intercutting between that moment and the chat between President Snow (Donald Sutherland) and Plutarch Heavensbee (Philip Seymour Hoffman), before culminating with quite the bang. In August of 2010 I posted “Daring to Dream: Casting ‘The Hunger Games’ Movie” on Cinematical. Not a single person I named was cast and I still stand by my choices to the point, but I must concede Gary Ross and Lionsgate did a much better job. However, that’s not stopping me from dream casting the sequel, Catching Fire. Of course there are quite a few characters from round one that will not return, but we’ve got quite the handful that are not only still in the spotlight, but consuming more of it. Catching Fireis Katniss Everdeen’s story just like The Hunger Games, so Jennifer Lawrence’s return is top priority. Sure this whole X-Men: First Class 2 thing put a little strain on the Catching Fireproduction schedule, but Lawrence needs to be front and center and the studio’s got to make that happen in any way it can.